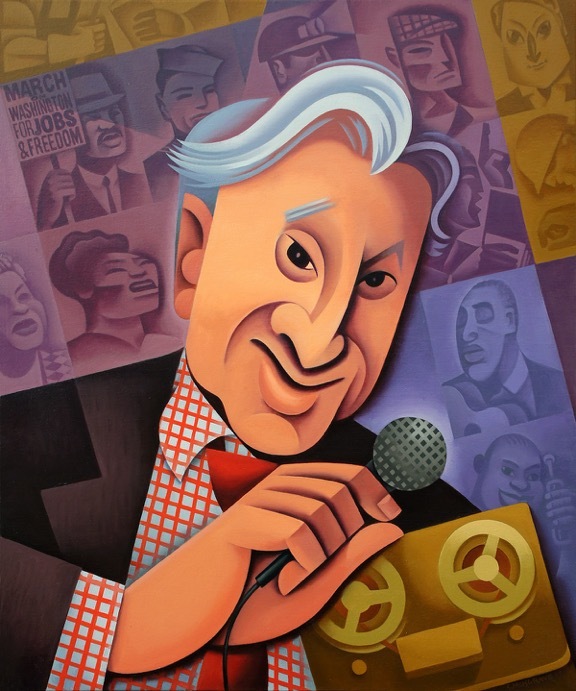 Studs Terkel by artist Steve Musgrave. Division Street: America, published in 1967, was Studs’s first book of oral history, followed by Working, Hard Times, and his Pulitzer Prize-winning The Good War: An Oral History of World War Two. (“Good,” he would later say, should have been with quotation marks because there is no good war.) Will the Circle Be Unbroken? and Hope Dies Last came toward the end of his life. Studs may have meant “Division Street” metaphorically, but his spirit occupied Chicago’s Division Street earlier this week—310 W. Division Street, to be exact, the home of the Near North Branch of the Chicago Public Library, which was marking its 20th anniversary. The Near North Branch started out as a temporary reading room in August 1997, which then became a study center for residents of the Chicago Housing Authority. Now, the squat grey building with sky blue accents on the roof and entry is one of the city’s busiest branches. Art has been part of the library branch since its beginning, but not the sort of generic “Get Caught Reading” posters, with celebrities like Rosie O’Donnell, Alicia Keys, and others that show up on many libraries’ walls. The Near North Branch aims much higher, as is evident in its series of “Illinois Writers” paintings by Steve Musgrave. There is a vibrancy and deep humanity to Musgrave’s portraits, which include some true “Land of Lincoln” greats: Nelson Algren, Saul Bellow, Gwendolyn Brooks, Lorraine Hansberry, Edna Ferber, Richard Wright—and, yes, Abraham Lincoln. Studs, who died at home in 2008 at the age of 96, is still revered in his hometown. On a warm August night, 50 years after the publication of Division Street, a crowd crammed into the library’s meeting room to welcome his portrait to the series. A mix of librarians from around the city, readers from the neighborhood, including the pioneers who fought to establish the library in the first place, and a tight-knit group of Chicago illustrators, gathered. An easel, draped by a red-and-white checked sheet—a nod to Studs’s standard shirt material—waited for Musgrave, a genial man with black-framed eyeglasses, to lift it. 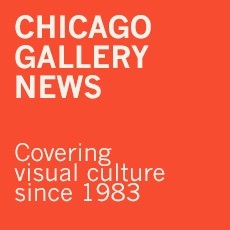 Hands are a distinguishing feature of Musgrave’s portraits, a subtle recognition that Chicago is a place where people built things with their hands and were respected for it. Holding pens, at typewriters—Musgrave’s authors are all doing things. Like Studs, they are activists. The series evokes Studs’s beloved New Deal, with an artistic style evocative of the muscular paintings of its Federal Arts Project. In Musgrave’s portrait, Studs’s head is cocked and he is looking right at you. He wants to know what you think. He’s holding a microphone, recalling his days as a radio host. In the background, there’s bluesman Big Bill Broonzey, jazzman Louis Armstrong, and the Queen of Gospel Mahalia Jackson, who defended him from McCarthy’s blacklist. He really loved Mahalia. Studs was an early champion of Toni Morrison, and she is part of the assembly. There are emblematic figures: a mine worker, a navy man, and a protester marching for “Jobs & Freedom.” In the corner is Andrew Patner, biographer of I.F. Stone, radio host, and writer, who knew Studs since childhood, and died too soon at age 55. Andrew’s presence was a tender reminder of Studs’s idealism, and the idealism of everyone who loved him. A dominant image in the painting is a big old tape recorder. Studs would often refer to his inability to work machinery. That was the segue to a story he liked to recount, particularly over scotch—a story that spoke to his ludditism, but more to the magic of his craft. During an interview with a Chicago woman who lived in public housing with her young son, Studs struggled with his tape recorder. Then the tape just stopped. Exasperated, he threw up his hands. The boy fidgeted with the recorder for a few minutes and must have hit rewind. They listened to the interview play back, in silence. This essay originally appeared earlier this month in The National Book Review (thenationalbookreview.com), a journal of books and ideas. We encourage you to sign-up for a free weekly email by visiting the site, or by emailing its co-founder/editor Elizabeth Taylor etaylornbcc@gmail.com. This entry was posted in Classic People on August 27, 2017 by Kay Whitfield.